Over the course of centuries, the Frisian coast was hit with numerous storm tides, some of which destroyed large tracts of land and caused numerous deaths. Residents of the region have long built dikes to fortify the coastline. 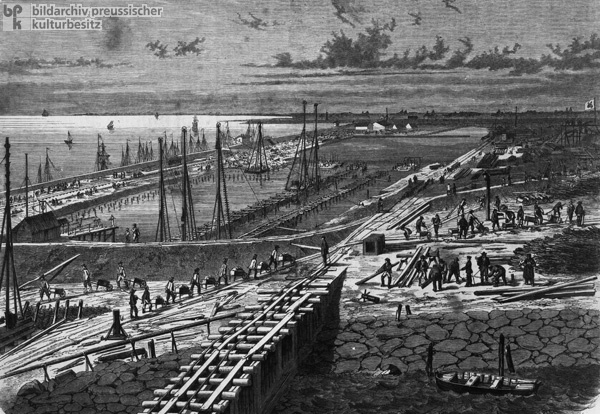 In 1853, Prussia acquired coastal territory at the entrance to Jade Bay from the Grand Duchy of Oldenburg for the purpose of constructing the Wilhelmshaven naval base, its first port on the strategically important North Sea coast. Work began in 1856, only one year after a massive storm tide had washed away the island of Old Wangerooge, previously located just off the coast. The port was completed in 1869. The following illustration shows dike construction on Jade Bay. The nineteenth century, an era of technological advances and scientific knowledge, saw a redoubling of efforts commenced in the Middle Ages to tame the elements. Wood engraving after a drawing by (Johann Jakob?) Kirchhoff, 1862.